"The Seer Steals the Show"
Stratford has previously presented tragedies by Sophocles and Euripides, but "Agamemnon" is the first tragedy by Aeschylus the Festival has ever mounted. Aeschylus (c. 525-456 BC) is earliest of the three great Greek tragedians whose works still survive. All ancient Greek tragedies were presented in trilogies and "Agamemnon" is the first play of Aeschylus' "Oresteia" (458 BC), the only trilogy that has come down to us complete and a cornerstone of Western drama. Anyone who saw the Oresteia staged in Toronto by the Royal National Theatre during the World Stage Festival in 2000 will know how powerful an experience the complete trilogy can be. It is a shame, then, that the Festival has opted not to present the "Oresteia" but rather a trilogy of its own devising called "The House of Atreus" following "Agamemnon" with "Electra" (1937) by Jean Giraudoux and "The Flies" (1943) by Jean-Paul Sartre. To fill in the background, when the Greek warships assembled at Aulis for the voyage to Troy, the winds ceased to blow. The goddess Artemis demands Agamemnon sacrifice his daughter Iphigenia to let them sail. For the ten years of the Trojan War Agamemnon's queen, Clytemnestra, has planned revenge against her husband for the deed. Now the war has ended, Agamemnon returns home with the prophetess Cassandra as his slave to the bloody welcome Clytemnestra has prepared. Director David Latham is obviously familiar with Katie Mitchell's production for the RNT. He uses the wonderfully image-rich Ted Hughes translation which the RNT first performed. He treats the chorus as a group of individuals and divides the lines among them. He plays up the comedy of the sentinel who has been watching for a sign of Troy's fall for ten years. Like Mitchell, he presents Cassandra to us in a head-to-toe white veil and directs her prophesies as painful birthings. And, shamelessly, he borrows the primary symbol of Mitchell's production--the red carpet Clytemnestra bids Agamemnon walk on to enter his palace made up of a child's dresses sewn together. Despite these "borrowings" Latham does have his own take on the tragedy. Unlike the high tech-plus-1940s RNT design, this production is set in the indeterminate past. Lorenzo Savoini's set consists of a square pool in front of traditional Greek façade, the broken pediment over the central doorway picking up the frequent mention in the text of how the House of Atreus cracked when Atreus exacted an horrific revenge on his brother Thyestes. Dana Osborne costumes the people of Argos as individuals wearing the kind of Middle Eastern peasant garb one can still see today. Agamemnon's armour (looking more Roman than Greek) is the only visual reminder that we are in ancient times. Latham has altered the text in a way most will find both unnecessary and confusing. The scene when Cassandra tells the chorus how she gained her gift of prophesy from Apollo and how he punished her when she rebuffed him is repeated four times--as a prologue to the action, again before her first appearance, in its proper place in the drama and again at the end with Cassandra as a disembodied voice. With a heavy hand Latham is underscoring the irony that Cassandra's punishment is not to be believed, and probably by extension, that we have not learned from history given Aeschylus' theme that revenge only begets revenge. The overuse of a child's doll to illustrate Iphigenia's plight suggests he thinks we won't get the point from the chorus's words. The best aspect of Latham's direction is his handling of the chorus. They are not the group of male Argive elders as in the original, but a mixed assembly of Argive citizens of all ages. Latham has carefully divvied up the lines among the group of eleven and directed them so they each have quite distinct personalities. Their individualized reactions create a rich background for the principals' speeches, though it would be wonderful if all had the same resonance and expressiveness of members Walter Borden or Maria Vacratsis. Karen Robinson comes close to capturing Clytemnestra's intensity. In her imagining of the fall of Troy and in her detailing of Agamemnon's murder, she portrays the queen in an eerie delirium of bloodthirstiness. However, a sense of cruelty and ghoulish anticipation should underlie all of her lines, especially in the profession of love of Agamemnon she gives the Messenger, to make the role truly chilling. This does not happen, Robinson falling back on a kind of coyness that does not suit the queen's ferocity. Sean Arbuckle does not have the physical or vocal weight to play Agamemnon. He looks like a young guy in a phoney beard, not a mighty warrior and the Greeks' "King of Kings". Where he should display a pride so overweening it makes us complicit in Clytemnestra's plan, we get only bluster. Sara Topham, in contrast, gives a hair-raising performance as Cassandra. Violent convulsions precede her utterances as if what she has to say is too horrible to speak, to sickening to keep in. The journey from re-living the horror of the House of Atreus, to foreseeing her own death to accepting her fate is both riveting and terrifying. Scott Wentworth plays a cruel, self-assured Aegisthus. Steve Cumyn could be subtler as the comic Watchman and becomes so later as the Herald. Wendy Greenwood's lighting is effective, especially in illustrating the sequence of bonfire signals and the conflagration of Troy. Those who saw the RNT "Oresteia" can rest assured that they saw the more compelling production. But productions of "Agamemnon" don't come around very often. Once caught up in Aeschylus' drama and in the sinewy language of Hughes' translation, you will probably wish you could continue through the story in their company. 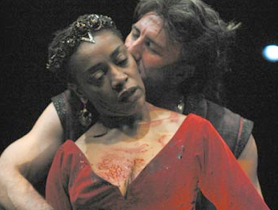 If nothing else, Stratford's "Agamemnon" shows what power this tragedy still holds. Photo: Karen Robinson and Scott Wentworth. ©2003 Terry Manzo.